Darosa d'Amour, who is known at home as "Bubbles" is a successful 138cm jumping pony who has competed at both HOYS and Hickstead, where he was placed 8th. 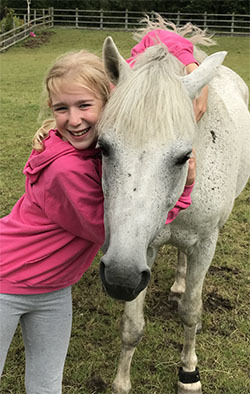 Bubbles was originally licensed by the SPSS in 2008 then had a successful competition career before being permanently graded with the SPSS in 2017 in recognition of his achievements and now being available at stud. The British Warmblood, Loganlea Irco, who is known as "Snodger" is an AES licensed stallion who has competed and gained British Dressage points at Grand Prix level and has just started a show jumping career at the age of 18. Snodger's sire, Lars Irco G, was following in the hoof prints of both his international showjumper sire and grandsire as he'd won and been placed in international GP level before he broke his leg in an accident at the age of just 10. Lars Irco G was also the sire of FEI registered Lar Chin G, Rosgan Irco Dora, the 3* eventer Kells Pride. Snodger's dam, Loganlea Fraulein is out of a Fein G mare who had BD points to medium and was a HOYS show hack. Fein G also competed as an international showjumper. Dam: Highweald Nightingale was a tiny pure-bred Dartmoor pony who had to stand on a straw bale to be covered by the 16.1hh Loganlea Irco. Damsire: Hopelaws Budgerigar is a 12.1hh pure-bred black Dartmoor stallion whose stallion advert says he has a "kind and gentle temperament, excellent conformation and a good amount of bone" and "himself a big winner in the show ring and his progeny are winning at county level". 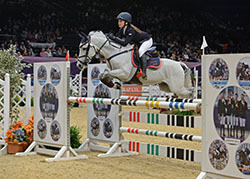 Bubbles was one of the most consistent ponies on the British Showjumping circuit in 2016. He was 8th at the Royal International at Hickstead, 3rd in the Waddesdon Stud 138cm Champs at Scope, qualified HOYS and then went on to be placed in the top 2 in 7 of the Hickstead qualifiers for 2017. 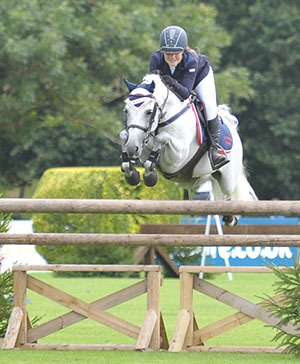 He was consistently jumping 1.20m courses before being sold to his new jockey 10yr old Tilly Shaw. Jumping in 80/90cm Opens, they soon started competing in the winter Pony Premiers and on their first attempt qualified for the 2017 11 & under British Showjumping Winter Pony Championships. At the Championships Tilly & Bubbles won the class and were crowned 11 & under Champions, quite an achievement in only 8 weeks of being together proving what an honest and generous character Bubbles has. 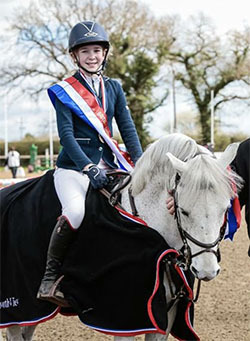 Bubbles was originally licensed as a sports pony stallion by the SPSS in 2008 when he gained the high score of 84.64% and was described as the judges (who included former international show jumper, Geoff Glazzard) as being a "very good type of sports pony stallion" and receiving just one score below an 8 and a top mark of 9.5 for his loose jumping. 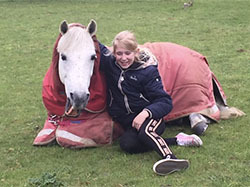 Following the grading, Bubbles concentrated on his successful competition career before being bought by the Shaw family, who are now standing him at stud again. 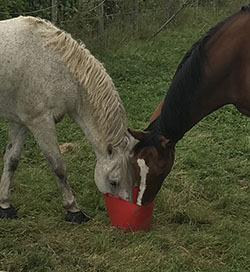 At stud, Bubbles is an absolute gentleman - and as can be seen from the photo will even share his dinner with his favourite mare. Bubbles' most successful offspring, from his early stud career, is Damour Damerrier.